Borderlinx | Buy Philips and ship worldwide with Borderlinx. Cheap rates guaranteed. Sometimes a company comes along that supports both your lifestyle and your health; that both entertains you, and is there when you need it most. Philips USA is committed to the health and the happiness of its customers, offering products from kids' electric toothbrushes, to televisions, to baby monitors, to coffee makers and much more. Philips USA has based its product innovation and inspiration firmly upon a foundation of helping people live their lives to the fullest for over a century. Discover how Philips USA products can enhance your life and keep you healthy, all at prices you and your family can afford. Philips USA offers state-of-the-art technologies, from home theater items such as televisions and speaker systems, to household items like kitchen appliances and mood lighting. Philips USA EnergyLight provides home light therapy to keep you shining bright during the winter months, and baby monitors help you keep an eye on what matters most. For entertainment, Philips USA offers a great selection of PC monitors and drives, headphones, projectors, and more! With round-the-clock customer service representatives ready to help, and many items priced under $100, Philips USA technologies are perfect for most lifestyles and pocketbooks. 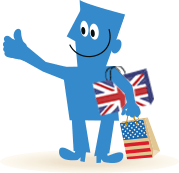 Now with Borderlinx, international customers can buy Philips in the USA! Borderlinx will ship your order to your home, calculating cheap shipping, tax & duties upfront with our Shipping cost calculator. A number of services are available through Borderlinx to make international ordering from Philips USA hassle-free, including concierge, free repacking and consolidation services.